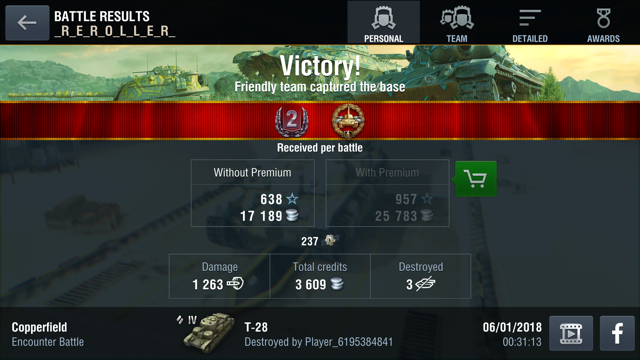 Well, thanks to the forum and all the advice I got, I aced the T28. Thanks to all of you for your help - I was clueless on how to use this tank, but I did what you said - kind of went into the middle of the action with the heavies and brawled. 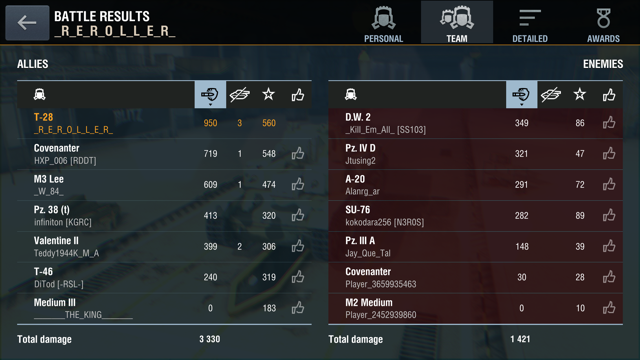 Fortunately, no mediums came to CoD me, and I had some good teammates watching my six (although near the end the T29 did get a pretty damaging shot into my rear). 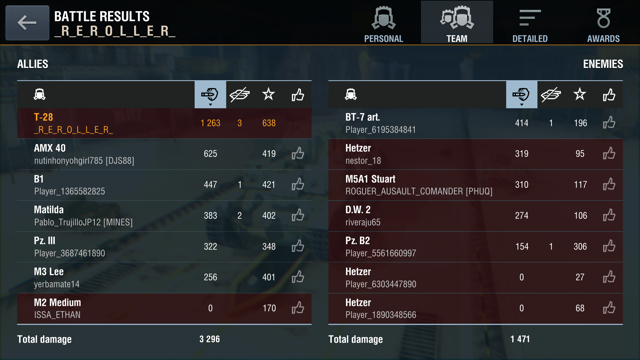 After the last red (the Ferdinand) had smoked my last teammate (our IS-6), I destroyed him by actually chasing him down, tracking him so he couldn't turn on me, and then blasting him to Hades. Good times! Perhaps I shouldn't admit this, as it further verifies my sealclubber status, but this is actually the first tier VIII tank I've ever aced. Onwards and upwards, baby! Thanks again, forumers! Edited by TonnerreCadien, 27 May 2018 - 04:02 PM. shoots HE all game at everyone and rams 4. Edited by minitel_NA, 28 May 2018 - 08:10 AM. I had a good Middleburg game in my KV-2 earlier. An SU100 said to go town but others called hills. Our 2 TDs went town but I lumbered up the hill anyway. An M4 came screaming past me on his way to join the TDs in town. Battling ensued and we were down big early. The TD who called town was the first to die started taunting the hill people in chat and saying “I told you so” and ironically lablled us “lossers.” The game was now a 1x4. I ram-killed the last remaining red on the hill so Green owned the high ground. A 1 shot Red Fury was kind enough to give me time to reload before cresting the hill and dying. A full health M6 appeared on the hill and got a shot in before I was able to react and then 1 shot him, as well. This whole time, the base siren was wailing so I edged close to the hill to take a look. That’s when I saw a red TD with single digit hitpoints right in front of me. Another quick ram and he was done. The last Red was another KV2 who was sitting on base. I rolled down to the city and then stopped to let my reticle settle. I edged around the corner and spotted the low health KV2 and fired as the timer hit 85. That earned me a Radley-Walters, Kolobanov, etc. 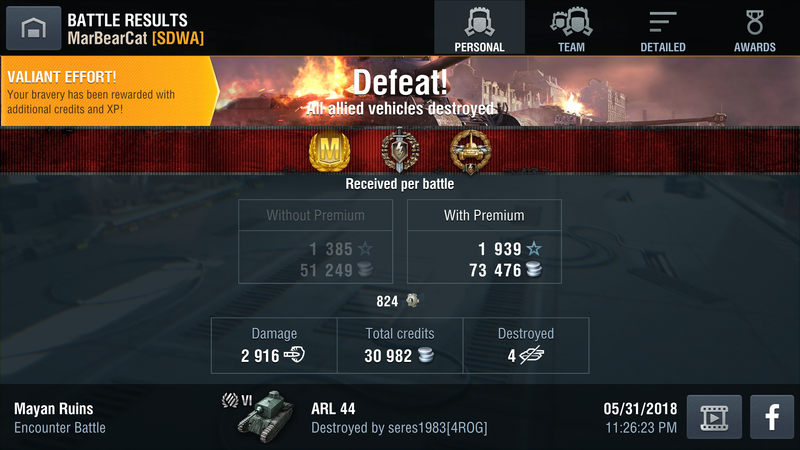 and this was the first time I’ve gotten 2 ram kills with the KV2 in one game. Was it a Mastery? No. Was it a First Class? No. My effort earned a Second Class medal. Top of the screen there looks like the chest of a North Korean general! Gj, Zeb! What gun do you use on the KV-2, just out of curiosity? The M10. 24 second reload lets me catch up on household chores, reading, etc. Good to see you in the thread. Edited by ZebraUp, 29 May 2018 - 09:48 PM. That is the dirtiest kolo I have ever seen. Lol, I will definitely accept that judgement. 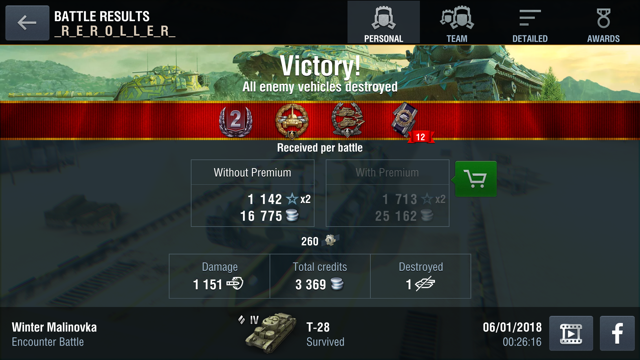 And then the one that made me happiest - my first Tiger (P) ace and it only took me 600 battles to get it. 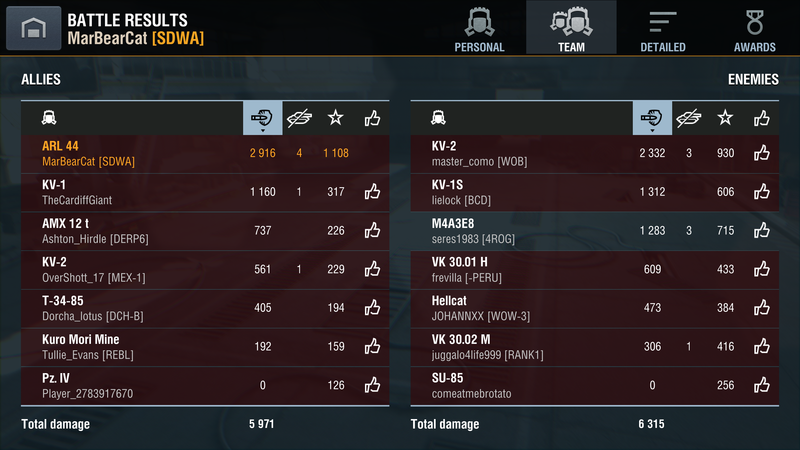 I think Gablehawk and I saw you in one of your first IS-3 games. Based on that, it is no surprise you have all these aces in it. Haven't played since 5 daze ago. Wanted to Ace my ARL for the longest time. Yes, I remember that game! 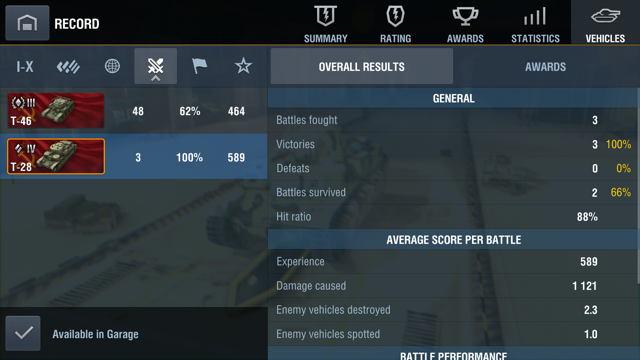 While not even close to my best win rate tank, the IS-3 is my best average damage tank so I occasionally have these awesome games. 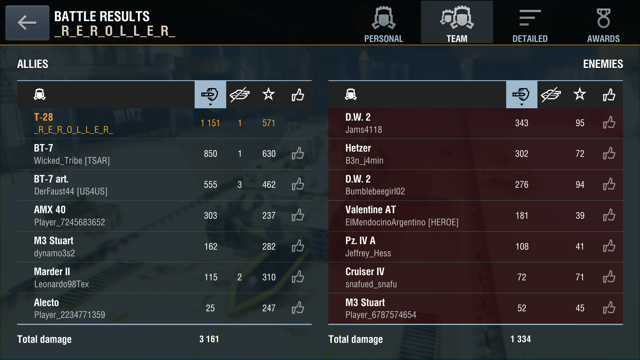 That was actually my very first game in the tank and I still maintain that I got mostly lucky in that one. Let me first start with the requisite lies. ”Hey I’m new am I doing ok” , “I’m new”, “I’m not a reroll”. Now that we got that out of the way, I got bored and decided to see what rerolling was about. 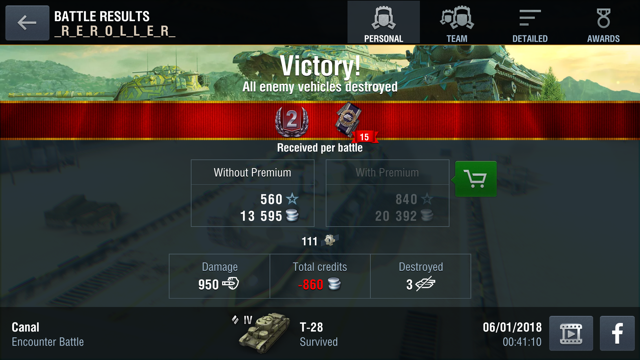 I haven’t played lower tier in awhile and was surprised by my T28 results. First 3 battles at 75% without top gun. I am a player that is on here regularly. FYI- I’m not a unicum in my main account. Edited by _R_E_R_O_L_L_E_R_, 01 June 2018 - 07:17 PM. And I had a player chat out "report kuro" after he died. As if I wasn't in the thick of battle and fighting my little Cat head off!!! Surviving / bouncing 2 hits while at TEN hit points!!! to say it looked like I was "throwing the game"
Who here thinks I would "throw" a game? As much as I want to win. to win that corner so you may want to either skip or get your ready. Edited by ArtyBait, 01 June 2018 - 10:05 PM. An entire team of window lickers who died in the first 90 seconds, so this was a loss.. as well as 3 points short of a Hall of Fame spot. Edited by ZebraUp, 04 June 2018 - 01:25 AM. I'm #6 or #7 with the Church III. Like the "Be tops in xp on your team" mission. This tank never fails me in that department. Edited by MarBearCat, 04 June 2018 - 05:59 PM.